Your favorite lube now comes in a mini bottle! JO FLAVORED is a delicious water based personal lubricant that adds spice to your sensual experience. JO Flavored is the only flavored lubricant that feels silky smooth like silicone with lip smacking great taste. Flavors include; Strawberry, Lemon and other very tasteful delights. 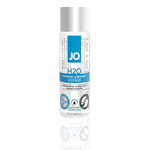 JO Flavored H2O Lubricant washes off easily with water, has no aftertaste and contains no artificial sweeteners. JO Flavored is never feeling sticky or tacky, long lasting, 100% latex safe and manufactured under strict U.S FDA guidelines.